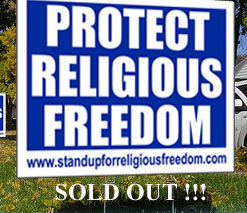 Please prayerfully considering getting involved in this effort, get a PROTECT RELIGIOUS FREEDOM yard sign for your yard, and forward to all your friends. We are a group of concerned citizens organizing an effort across midwestern-southwestern Ohio to pray, educate, and witness for the protection of religious liberty. Below are details on our plans and how you can get involved. – Prayer campaign that started 40 days before the election – see details below. – A Pilgrimage for Religious Liberty on October 28th, from 1-4 pm at Maria Stein Shrine of the Holy Relics. Details below. – Get a “protect religious freedom” yard signs. Locations are listed below. Dayton, Cincinnati, and Columbus please go to http://www.standupforreligiousfreedom.com/. – Organize an hour of pray for religious freedom at your Church, details at www.usccb.org/freedom. Let us know if you need help planning and we’d be happy to help spread the word. – If you are interesting in helping distribute yard signs and educational materials in your community contact us. – We need individuals and businesses to donate money for the printing of the signs. We would like to do another printing as soon as possible. We will continue to print signs as long as there are people who want them and money to print them. Checks can be made out to One More Soul and sent to 109 North Street, Russia, OH 45363. This is a tax deductable contribution. Any amount is helpful. We will be putting all of our donors who wish to be made known on all of our emails and our Facebook page. If you do not state that you want to be made know, we will assume you wish to remain anonymous. Please take a moment to say a prayer for our anonymous donors. If you have any questions or would like to be involved in the grassroots campaign please contact us at protectreligiousfreedom@gmail.com and please like us on Facebook – Protect Religious Freedom SW Ohio www.facebook.com/ProtectReligiousFreedomSWOhio and follow it as it grows. Troy – 19 S Cherry St.; Miami County GOP, 9 W. Main St.
Centerville – St. Mark’s Bookstore, 895 S. Main St.
October 28th, from 1-4 pm at Maria Stein Shrine of the Holy Relics. You can come for all or part of this afternoon of prayer with Eucharistic Adoration and Exposition. There will be prayers said every half hour and time for silent prayer. All are encouraged to come to this holy place to pray for religious freedom. A group of young adults are organizing this. Today is 40 days before the election. Today starts 40 days for religious freedom. Please join us in praying and fasting for religious freedom! * Our patrons: St. Thomas More, St. Thomas Beckett, and St. Victoria, pray for us! This entry was posted on Friday, October 26th, 2012 at 12:23 pm	and is filed under Featured, News & Commentary. You can follow any responses to this entry through the RSS 2.0 feed. You can leave a response, or trackback from your own site.